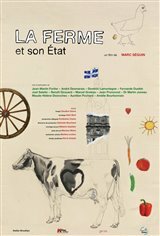 In Quebec, organic farm production innovations are hampered by the outdated regulations of the Ministry of Agriculture and the corporate interests of the agri-food industry. This is what director Marc Séguin found after an 18-month investigation during which he visited not only various family and experimental farms throughout the province, but also in the United States and Denmark, the latter distinguished by the coherence and effectiveness of its new agricultural policy. Doctors, economists, nutritionists, agronomists and politicians join the discussion.